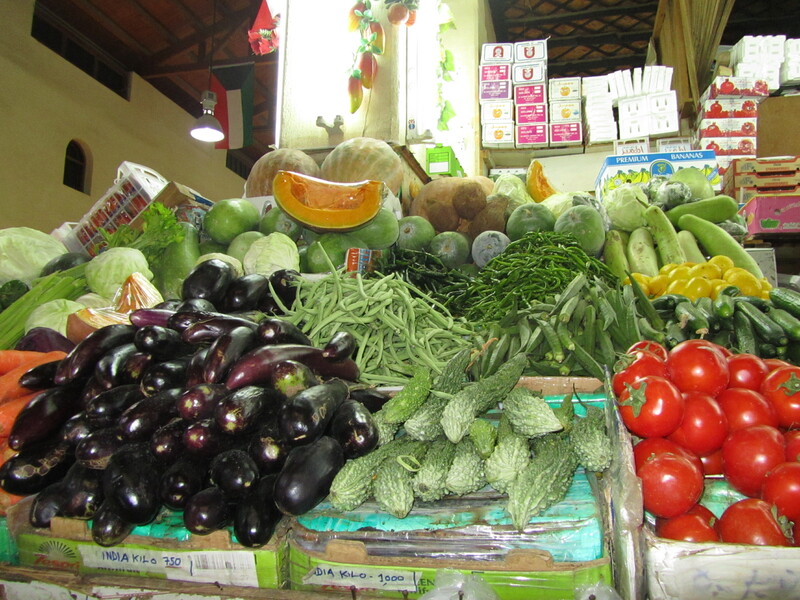 On Monday, we took an evening journey to The Heritage Souk (market). 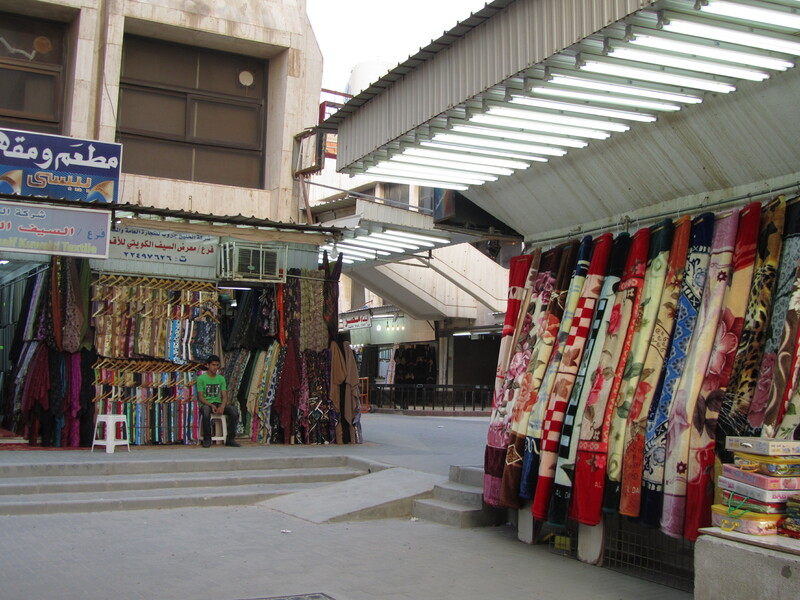 This area is the original shopping centre of Kuwait, and it’s a place you’re likely to find more locals than foreigners, not that many spots in this state are saturated with people from far away. 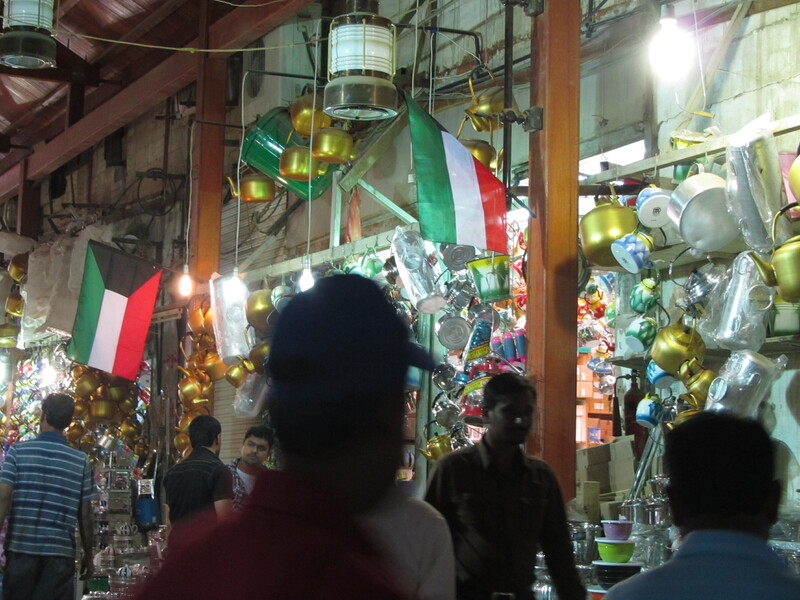 Kuwait’s souks are not organized in the way you might anticipate, with a variety of vendors serving each area like malls and shopping centres do back home. Here, each type of item is concentrated in a specific place. If you want greenery for your home, you drive to the plant souk, which features shop after shop selling plants for inside the house and out in the garden. When you need shampoo or conditioner or nail polish, head for the hair souk, which sells every kind of beauty project imaginable, but ironically did not have the kind of hair pins we wanted for The Electrician’s mother. It’s an awkward way to organize the shopping for a person who is used to Wal-Mart super centres and one-stop purchases, and lists and plans are a must here to maximize efficiency and minimize frustration, but it does make sense in its own way. The entry street, before the lanes narrow and things feel really crowded. 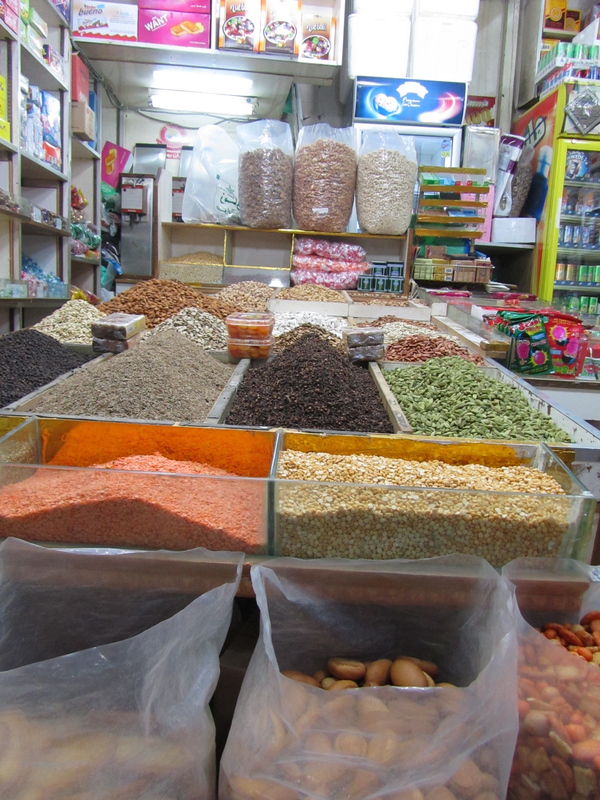 Unlike the others, The Heritage Souk contains a little bit of everything. We parked at the edge and wandered for seemingly endless blocks through separate districts, each filled with small shops packed edge-to-edge like mailboxes in a single-level post office. Despite neighbours selling identical items and competing for customers, there seems to be a geniality between the shopkeepers: the woman I bought scarves from asked the man selling across from her for change, and he gladly provided it. It took us a long, long time to get to the scarf woman The Electrician’s mom favours. His momma took the photos featured in this post because my camera battery was kaput before we even arrived at the souk. Just like the other markets, this one was organized by type of merchandise, even if just about everything was available somewhere in the souk. Inside The Heritage Souk, a person can find everything from genuine jewelry to items we would generally pick up at the dollar store back home. 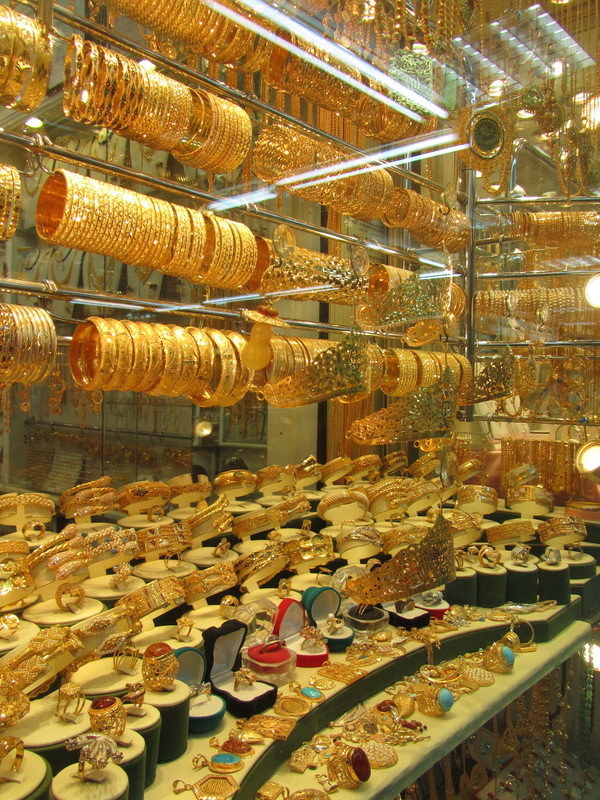 The gold shops were particularly stunning. It seems to be all 18 karat and higher, based on how yellow it is. There was also a meat souk, where a person can buy the freshest possible cuts of lamb, goat, beef, and other creatures. I have photos of that area but won’t be sharing them here because it was overwhelming, particularly since many vendors were selling heads for stewing with the eyeballs still intact. It was a disturbing part of the evening for me. Let’s look at the produce and dry spices instead, shall we? These should make your mouth water rather than turning your stomach. 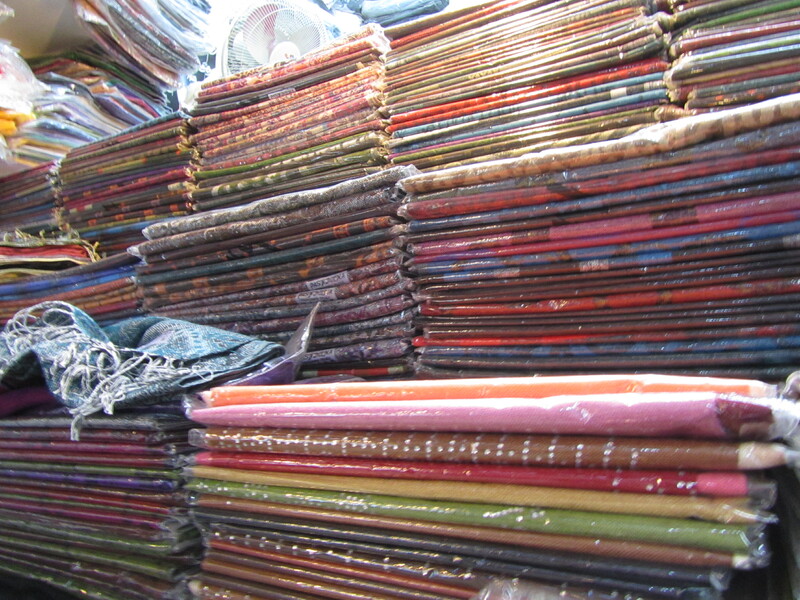 After walking next to forever, we found the scarf lady, who was eager to help us and had countless fibres, weaves, colours, and patterns to choose from. It took us a long time to browse her collection before making our final choices. A teensy fraction of her extensive selection. Because we took way too long shopping for scarves, The Electrician and his dad explored the open area just beyond the shops, which I can really only describe as a run-down food court with no English on the menu. Reluctant to wait for dinner (and with momma bear’s disapproval) the boys ordered food for the group while the ladies shopped. When I sat down at the long wooden table shortly after an employee draped it with a fresh “cloth” of thin cellophane printed with a red arabic design, I was certain we were in for what The Electrician refers to as “30 minute chicken.” That’s the kind of food you see first on your plate and then again in the toilet a half hour later. The ladies at the table passed the hand sanitizer and looked nervous, and the men poured us water from the giant group bottle into the little cups brought by our waiter. Each of us had a flimsy plastic cup, plastic cutlery, paper napkins, and an oval aluminum plate buffed to a high sheen despite the nicks and scars in its surface. The first thing to arrive at the table was a type of salad greens I’d never seen before, complete with peeled fresh onions (the big white ones) and lemon wedges. Then a man came with two baskets loaded with traditional round bread too hot to touch spilling over the sides. Imagine large pizzas with nothing on top and you will have an idea of the size of the flatbreads. I think we ended up with eight or nine pieces that size for the five of us. I could have just eaten bread with lemon and been a happy woman. Suddenly, the man came back with two platters of saffron rice and two large bowls of a chopped and marinated veggie salad with fresh tomatoes, zucchini, cucumbers, onions, and herbs. It smelled heavenly. 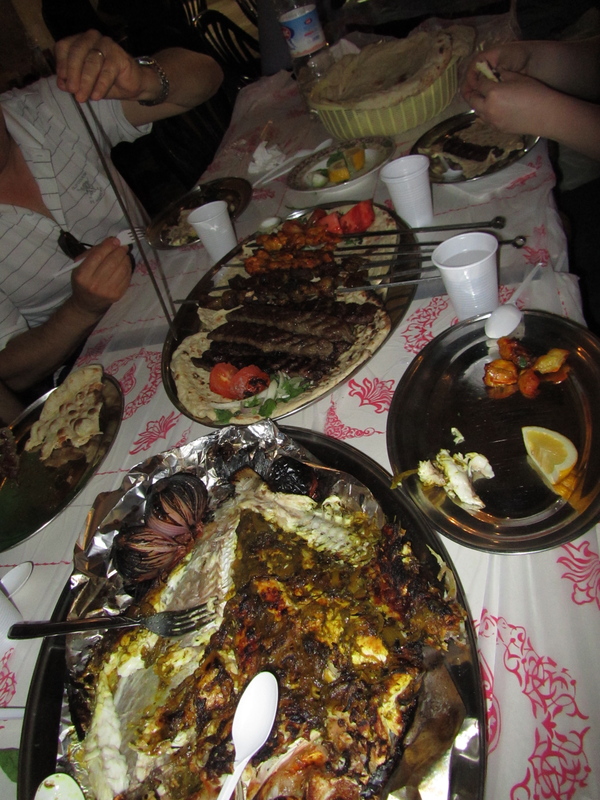 Before long, we also had a whole local fish grilled with basil, cumin, and citrus, and a syrupy sauce to spoon on top. Apparently, our boys were beyond hungry when they ordered, because we also got a mixed grill platter of chicken and beef skewers, and grilled ground lamb with arabic seasoning. We were so mesmerized by the abundance of food that we forgot to get a photo before we starting eating. This is about a quarter of the way into the meal. As dives go, we found a true gem! Despite the modest, dusty surroundings, the food was superb. We were also the only people there who didn’t seem to be from the area, so I guess we stumbled into local cuisine that is popular with the folks who live here. As we ate, everyone except me (because I’m so lucky) broke either their forks or their spoons or both, making getting the food from plate to mouth a challenge that added to the ambiance. Finally, to finish the meal, the server came back with tiny glass vials of strong tea with sugar and tea leaves sitting in the bottom. We were so full we could hardly move, and The Electrician’s parents have declared they will take all visitors for meals at The Heritage Souk from now on. Not a single person got food poisoning, either. Great success in hole-in-the-wall cuisine. What a wonderful, flavorful, and colorful experience! I really envy you. This is certainly a trip of a lifetime.